I've been shopping my closet for almost three weeks now. I sound like a broken record, but I haven't worn even the tiniest fraction of what's in there. Yikes. Luckily, the urge to buy something new is diminishing each week. My friend Carrie started a "Let's Be Shop Free For 3" group, and all of her suggestions have been very helpful. Unsubscribing from store emails made a huge difference since I'm not bombarded all day long with tempting sales. Carrie also asked us to count our fall/winter clothing so we would have an idea of what items we own. I started with cardigans - and counted 31. That's not all of my sweaters....just cardigans. Double yikes. So I shall press on with my challenge! I've only got five outfits to share this week because I'm out of town at a Builder's Show and had to prepare this post before I left. I pulled out my white jeans in outfit #2, and I really liked how they looked with tall boots. I ended up thrifting the plaid shirt in outfit #4. It was very heavy and big, and I've got other plaids that I like better. Plus my brother said I looked like a lumberjack, and while I rarely take fashion advice from people who wear camo most of the time, I had to agree with him. This was my favorite of the week. I'm channeling my inner Shaunacey and finally wearing these burgundy jeans that I bought at Loft in the fall. I can't remember where I got the sweater, but the suede booties came from Macy's and have just the right amount of fringe. Come back next week to see if I managed to visit Vegas without shopping. On the one hand, they have the best outlet mall there, but I'm travelling with the "anti-shopper", aka my husband. So there will probably just be eating and working. And hopefully a show or two thrown in. Wish me luck. If you're looking for your own wardrobe inspiration this winter, my stylish friend Lisa has just the thing for you. Read on to find out about her new series. The best part? 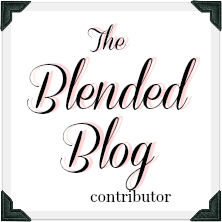 If you're one of the first five people to sign up from my blog, you'll get to participate for free! Do you need some style inspiration this winter? 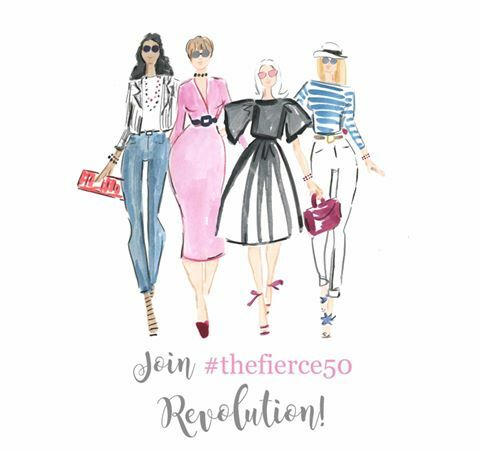 Do you want to get to know other women - and share in some fashion fun? Join a new series called DAILY STYLE FINDS: WHAT TO WEAR. Daily Style Finds: What to Wear will show you how with only 15 wardrobe essential pieces (the ones all women should have in their closet) - you can create 20 stylish, on-trend head-to-toe looks. Each of the 20 looks will be presented in a stylish format, along with some beauty suggestions. And, so, this meets everyone’s needs, you will be provided with both casual and work/professional options, so that each look works for all lifestyles. In addition, as women, we like to seek inspiration and input from others - so as a participant, you will have access to an exclusive Daily Style Finds: What to Wear online community where you can ask style questions, share what you are wearing, and find more style inspiration. You can get this for FREE if you are one of the first 5 readers to sign-up using the discount code (Code: twoteens). In addition, for all that register, you will have a chance to win $50 PayPal cash or a $50 Nordstrom Gift Card. If you are not quick enough to grab one of the first spots, you can still register for only $9.95. The ultimate goal of the series is to help you feel more confident, save time figuring out what to wear each day, and shop more wisely. And, of course, have FUN in the process. Click HERE to register. Registration begins January 19, and the series will begin on February 1. This is sure to be a fun, new, and stylish adventure! Love the Shaunacey-inspired outfit! I can't, but kinda can miss always cold, believe that you have 31 cardigans! I want to see a picture of that. Also- you can visit the outlets with me later!! We are definitely going to the outlets! I'm afraid to count the rest of my clothes. I like the burgundy pants! I started to go through some of my closets (yes I have more than one) and tried to go through some of my dresses. I managed to choose 10 to take to the consignment store. Sounds good right? That was until I decided to count the number of dresses I own. 135. Yep. It was like being an alcoholic and seeing every drink I've had in my life. One of my bloggy friends said not to be too harsh on myself since I could have a much worse addiction. At this point I know I've passed the regular shopper, I'm well into the realm of a collector. Loving vintage has created a monster. I've always heard that Vegas has great thrift and vintage stores. Good thing I'm not there with you! We could probably get into a lot of trouble in Vegas. I don't think there's anything wrong with being a collector of clothes. Yep, there are way worse addictions we could have! I wouldn't even own burgundy pants if it weren't for Shauancey :)! The Shaunacey inspired outfit is so cute! Taking inventory of your clothing is a great idea! I need to do that! I haven't gotten very far with the inventory - the cardigans scared me! I'm so glad you got in on the style series. Lisa has great style and it will be lots of fun! You and Sarah and Shaunacey all do Shaunacey so well. I haven't gotten up the courage to wear my white jeans since Labor Day...I know, I know. Maybe this weekend. With the boots, they really look wintry, huh? Like snow! I hope you give the white pants/boots a try. It would look great on you! 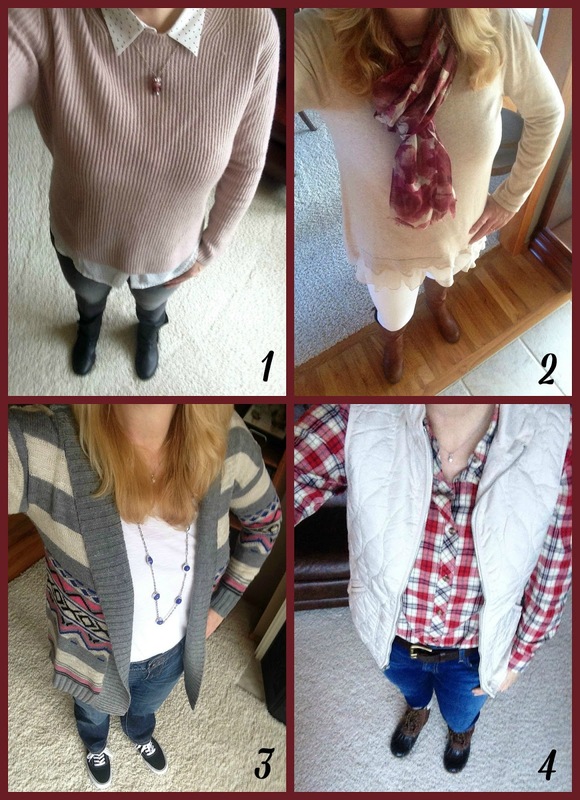 I think my favorite outfit is # 3. I think it looks very "fun." I hope your trip was wonderful. Thanks Susan! That cardigan is kind of fun! you look gorgeous as usual - I think I like outfits #1 and #2 the best. Have a great weekend with your husband and I bet you find a bargain or two! You are so sweet - thank you Leanne! Great looks, friend! I still have about 25 sweaters and I live in Texas! Slowly, I keep discovering what I'm willing to let you. So glad we're on this journey together. Me too Carrie - you inspire me! 31.. cardigans? I'm cracking up. That is awesome. I only have one but I don't look good in them. Your favorite outfit is awesome. I love cream and burgundy together. I know, right? Too many cardigans. And that's just the tip of the sweater iceberg.